This looks lovely in dark red which I am pretty sure is its original paintwork - it has not been tampered with underneath. The silverwork has been touched up but done well. It is in excellent condition all round and a super example of this model which was one of the first to have something that opened as well as suspension and seats etc. This is the later variant with the filled in air vent on the bonnet and without a model number on the base. The wheels have the stick-on ‘spokes’ and there are plates and a licence disc from one of the sets issued by Corgi. 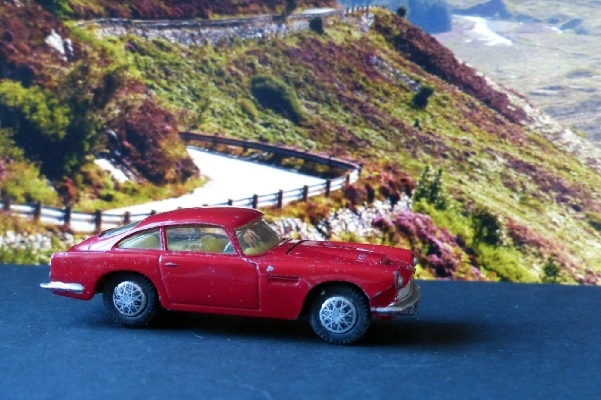 This is just a fabulous car and model and has come to represent the Corgi brand in many ways, not least, of course, in the various Bond versions.